It's a common complaint: You feel like you're working constantly, and there's never enough time to enjoy life. But as a whole, Americans are working far less now than they did a generation ago, and have more leisure time than ever. 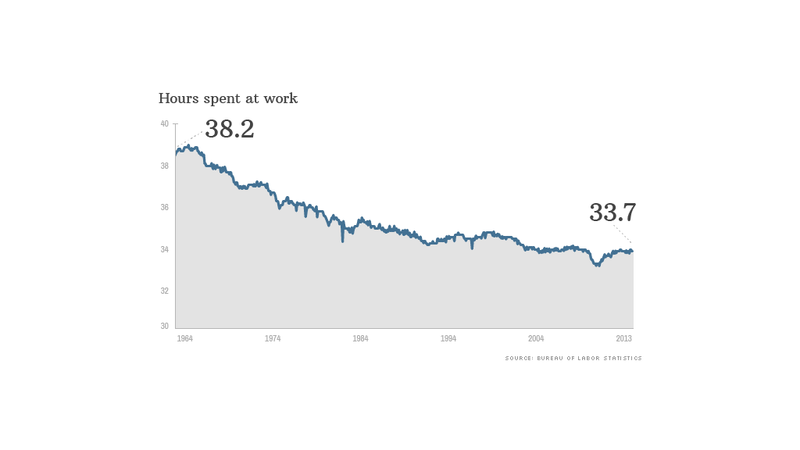 The average work week has gone from over 38 hours in 1964 to under 34 hours in 2013 -- a drop of nearly 12%, according to the Bureau of Labor Statistics. A big reason for the decline is the growth in part-time jobs, which have surged as more women entered the workforce and the number of restaurants, shopping malls, and other establishments that employ part-time workers have exploded. Another explanation is that people tend to stay in school longer and retire earlier, clocking fewer hours over their lifetime. Men in their 50s, for example, have been retiring or entering semi-retirement earlier and in greater numbers than those in previous generations, according to John Robinson, a sociology professor at the University of Maryland, and are partly responsible for driving down overall work hours per week. Share your story: Are you working less but maintaining the same lifestyle? And we're working a lot less than our grandparents, great grandparents and earlier generations. The average work week for a manufacturing employee in the 1860s was 62 hours, according to a paper from Robert Whaples, an economist at Wake Forest University. In the 1600s, there were actually laws requiring a minimum work day, wrote Whaples. In parts of the country, most people had to work sun up to sundown -- part of the Puritanical "idle-hands-are-the-devil's-workshop" ethos. It wasn't easy to change that culture. Political battles that led to less religious influence over the nation's laws almost sparked a civil war. A century later, labor activists fought for decades to get the 40 hour work week. Coinciding with the shorter work week is a rise in leisure time. Americans reported having just under 35 hours a week of "free time" in 1965 -- that's time not spent at work, doing housework, eating, sleeping or doing other activities necessary for day-to-day survival, according to research by Robinson, who directs the American's Use of Time Project at the University of Maryland. By 2012, it had reached 42, according to the Bureau of Labor Statistics. "People feel less rushed than they did even a decade ago," said Robinson. And thanks to modern technology, the time we spend on housework and cooking is declining. Just what are we doing with all these extra hours? Watching more TV, mostly. But technology certainly hasn't made all our lives easier. Some people, especially those at the higher end of the earnings spectrum, report working more hours than they want to. This is particularly true for professionals who are now tied to their work by smartphones and email. Also, many Americans are working part time not because they want to, but because their jobs have been replaced by automation, outsourced, or otherwise eliminated. "The promise of technology is that we'd all get to work less," said Linda Barrington, head of the Institute for Compensation Studies at Cornell University's school of Industrial and Labor Relations. "But it's playing out differently for different people at different income levels." Share your story: Are you working part time, but would rather work full time? Barrington believes the Affordable Care Act - a.k.a. Obamacare -- is the first real law intended to deal with some of the disruption of a changing workplace, as more Americans enter freelance or part-time positions that don't provide health insurance. As happened during the industrial revolution, she feels other measures will need to take shape to make the technological revolution more beneficial to all workers. "How are we going to change the rules again?" she asked.